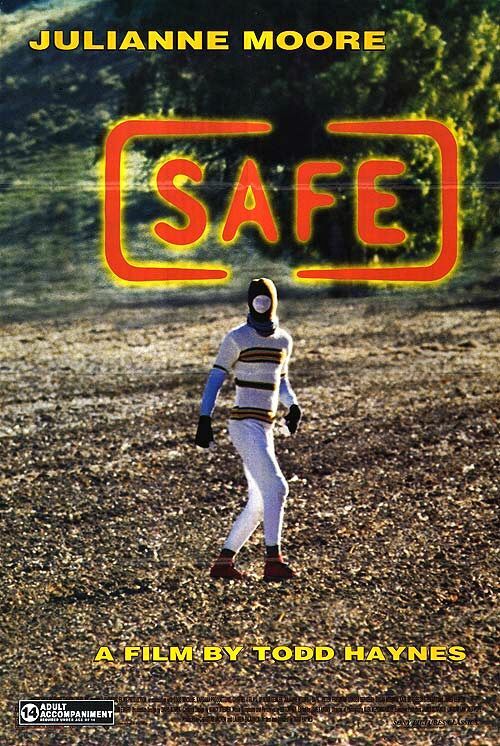 Tag line: "SIn the 21st century nobody will be...Safe"
In Todd Haynes’ Safe, we meet a woman who's suddenly become allergic to the world around her, who can no longer tolerate the pollutants in the air, or the cologne her husband wears. Her condition may be psychological, as the doctors suggest, but even if it is, how exactly does one go about treating it? The woman in question is Carol White (Julianne Moore), a housewife who grows violently ill when exposed to common household chemicals, perfumes, and, before long, even the air she breathes. Her husband, Greg (Xander Berkeley), has a hard time understanding her condition, and the doctors can't decide what to do with her. With nowhere else to turn, Carol retreats to a desert community run by a man named Peter (Peter Friedman), who promises a very holistic cure, one he believes is capable of treating any disease, no matter how severe it might be. I liked the way director Haynes utilized sound throughout Safe, and his choices, though sometimes quite intense, do succeed in bringing us into Carol’s world of chemical upheaval. As she's getting a perm at her local beauty salon, we're treated to a variety of sound effects, including a rather sinister gurgling, as if some mad scientist were hard at work developing a new poison to unleash on the world. 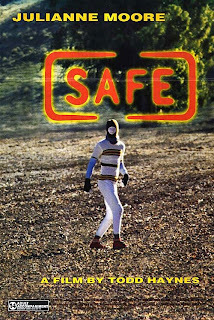 To coincide with the background noise, Safe also boasts a tonal musical score, one that aptly defines Carol’s experiences in suburbia and its “contaminated” atmosphere. What's interesting is this ominous score doesn’t subside once Carol moves to the desert; it continues on, signifying she hasn’t yet found the remedy for her situation. The sounds of suburbia, the traffic jams and passing helicopters, have simply been replaced by chirping crickets, and the droning on of insipid folk music. With Safe, Haynes asks more questions than he answers, mostly because there are no easy solutions to Carol’s dilemma. As ridiculous as it is to throw toxins into the air or pour pollutants into streams, it's equally as bizarre to believe in a completely holistic lifestyle. Both worlds have their share of poisons, and, as the film suggests, one's not necessarily a solid replacement for the other.